InFocus’ latest mini-desktop adds VGA output, an Ethernet port, a headphone jack, and a 2.5-inch hard drive bay. 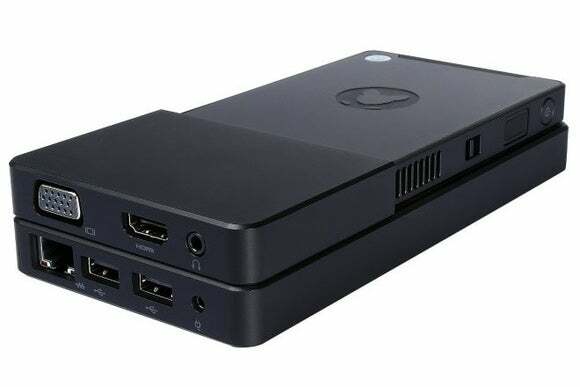 InFocus’ Kangaroo is one of the more interesting mini-PCs on the market, and now it’s getting more useful with a “Pro” version. Like the $100 Kangaroo PC that launched last October, the $200 Kangaroo Pro is a pocket-sized Windows 10 machine with an Intel “Cherry Trail” Atom x5-Z8500 processor, 2GB of RAM, 32GB of storage, a built-in four-hour battery, and a fingerprint reader for Windows Hello. The new model, however, comes with a beefed-up desktop dock. In addition to HDMI, USB 2.0, and USB 3.0 ports, the Dock Pro includes ethernet, VGA output, and a headphone jack. Users can also unscrew the dock’s bottom plate and install a 2.5-inch internal hard drive. Unfortunately for current Kangaroo users, and owners of the more powerful $170 Kangaroo Plus, InFocus is not selling the new Dock Pro separately. The company tells PCWorld that it may sell the dock by itself at some point in the future, but didn’t provide timing. Why this matters: Even with the Pro model, the Kangaroo is still a lightweight PC. But at least now it can serve as a media center PC, or a desktop with VGA monitor and external speakers, without an array of extra wires, connectors, and USB hubs.